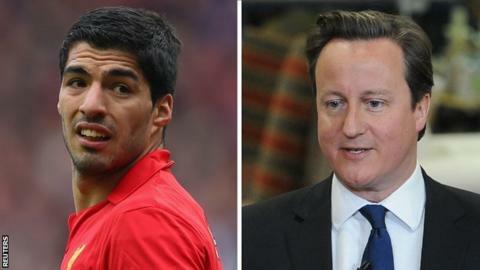 Prime Minister David Cameron says Liverpool striker Luis Suarez set "the most appalling example" by biting Chelsea defender Branislav Ivanovic. Suarez has since been by a Football Association panel. "As a dad and as a human being, do I think we should have tough penalties when football players behave like this? Yes," Mr Cameron told BBC Radio 5 live. Before the panel announced a punishment that Liverpool said left them "shocked" and "bitterly disappointed", Mr Cameron had said that "it would be very understandable if the panel took into account that high-profile players are often role models". "The Prime Minister even chipped in with something which was a different matter altogether," said Rodgers on Thursday. "There's no doubt if you have those high-profile figures making those sort of statements, there will be a bias. "That's the first time I've heard of an independent panel being dictated to by so many people." However, Mr Cameron, speaking on Friday morning, denied that he had deliberately intervened. "I made my own views clear, just as a dad watching the game," Mr Cameron added. "I have a seven-year-old son who loves football, loves watching football and when players behave like this, it sets the most appalling example to young people in our country." Liverpool will allow Suarez himself to decide whether or not to appeal against his punishment for the incident in at Anfield. The Uruguay international has accepted a three-match suspension for violent conduct, but could contest the additional seven-match punishment. Liverpool received the FA's written reasons for the 26-year-old's ban on Thursday and have until 12:00 BST on Friday to lodge an appeal. Although Suarez will make the decision over whether to contest the suspension, Rodgers has criticised its severity, saying the FA had "punished the man" rather than the actual offence. Rodgers said the punishment would not help the player's rehabilitation. Reds goalkeeper Pepe Reina also criticised Suarez's ban, calling it "absurd and unfair". Suarez has apologised to 29-year-old Serbia defender Ivanovic and was fined by Liverpool on Monday.